Ever Heard of Paper Pumpkin? Get your Paper Pumpkin Today! One thing that has lots of craft appeal to us, are the monthly subscription boxes. I don’t care what you’re into, there is a subscription box for it. They’ve got them for washi tape, pens (yes, I said pens), watercolor, planner stickers, and even card making. (Card making is my jam, by the way). There are seemingly countless places to subscribe to card making monthly kits. I won’t mention them, but if card making has craft appeal to you, you already know their names and how much they cost. 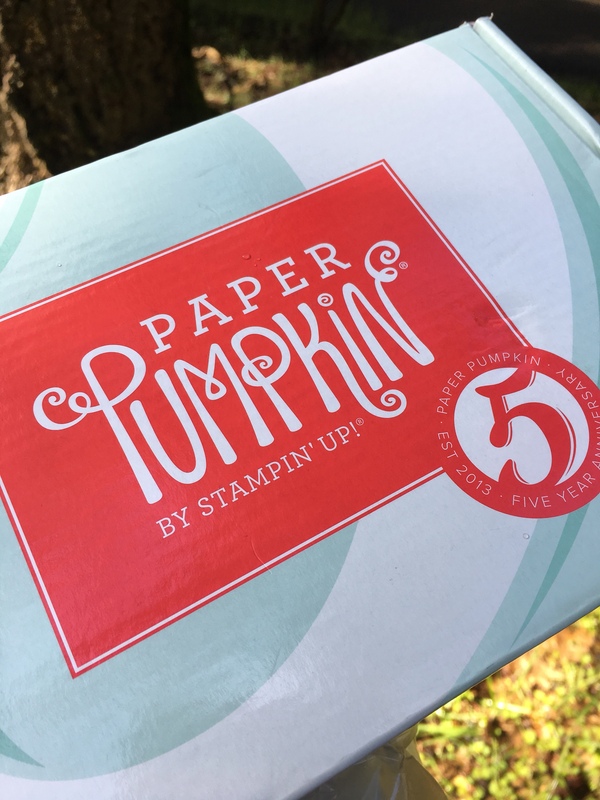 I found Paper Pumpkin through Stampin’ Up. I learned of Stampin’ Up about 7 years ago (they turned 30 this year). However, I never knew that they had a subscription kit. As it turns out, Paper Pumpkin is 5 years old as of last month. The kits run $19.95 a month (this includes shipping). You can count on every box having a cube of ink (which won’t repeat a color for a full year) and a stamp set. Assuming it is a card kit, there will be enough material for 8-12 cards with envelopes. There are times when the kit has a paper craft other than cards. All the contents are color coordinated and include the adhesives necessary to assemble the project. It even comes with instructions that include pictures. While I’ve been handcrafting cards for years, Paper Pumpkin has craft appeal to me because it’s EASY. I don’t know if you are as guilty as I am of buying a card making kit with full intention of making cards and mailing them out, but never getting around to it because you know it’s going to take some time to be creative and make the cards! You know the scenario? It is actually so easy, you can get the kids to putting these projects together and they just might enjoy themselves. Below I’ve included a video I put together featuring the Paper Pumpkin. 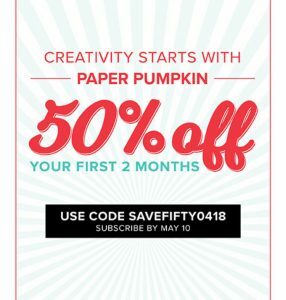 Stampin’ Up has an awesome Paper Pumpkin promotion going on from now until the 10th of May. You can check it out here.